This week's French Friday with Dorie recipe is Garbure from the Supermarket. Huh? Apparently the name of this rustic, chunky soup comes from the fact that you eat it with a fork. There are no set ingredients in France, as it is meant to use up whatever you have. This impresses me because I bought but forgot to add the beans, I couldn't buy turnip, I didn't add sausage or duck confit, and I used cayenne pepper instead of the fancy spice you were supposed to use. As you can see from the photo, I also didn't end up with much liquid in my soup after the three hours (yes, you read that right!) of cooking time. Despite all of that, this dish was really, really good. It had heat, it had texture, and it had both meat and veg, making it a complete meal. I used a ham bone to make my garbure, and the meat just fell off the bone, creating deeply satisfying, gelatinous goodness. Because of the long cooking time, I probably won't make this again, but boy it was good to try once. It was so delicious and satisfying - my kind of soup. To see what the other Doristas thought of Garbure from the Supermarket, visit the LYL section of the website. Next week, we have two toasties on the menu - oops, tartines. Harry and Christo, eat your heart out. Today is Val's birthday, and I was in the mood for cupcakes. In particular, I had been planning for weeks to make cupcakes with daisies on top, as I finally bit the bullet and bought the moulds to make the daisy centres. When I think of daisies, I think of bright and sunny, which in turn leads me to the colour yellow. Yellow translated into flavour means lemon - so I made Val lemon cupcakes filled with lemon curd, topped with lemon buttercream frosting, and crowned with a fondant daisy. The base cupcakes are lemon cream cheese cupcakes from the Sweet Violet Cakes recipe on p91 of the Australian Womens Weekly Cupcakes book. Preheat your oven to 180 degrees Celsius, and line a 12 hole muffin tin with cupcake papers. Beat the butter, cream cheese, zest, sugar and eggs together in a stand mixer until light and creamy. Add the flours to the mixture and beat on low speed until just combined. Using an icecream scoop, place the batter into the cupcake papers, and bake the cupcakes in the oven for 25 minutes or until cooked through. Remove the cakes from the oven and immediately unmould them from the tin onto a wire rack to cool. The recipe that I used to make the lemon curd was from Dorie Greenspan's Around My French Table. The recipe is posted online here. I only made a half recipe and still have stacks left over. I liked this recipe because it uses whole eggs, so there is no umming and arring about what to do with the whites. I piped lemon flavoured buttercream icing on top of the cakes, using the Primrose Bakery Vanilla Buttercream recipe, and substituting lemon juice for vanilla essence. The day before making the cakes, I made daisies using ready rolled fondant in white and a small amount tinted in yellow, a daisy plunger cutter and a daisy centre mould. 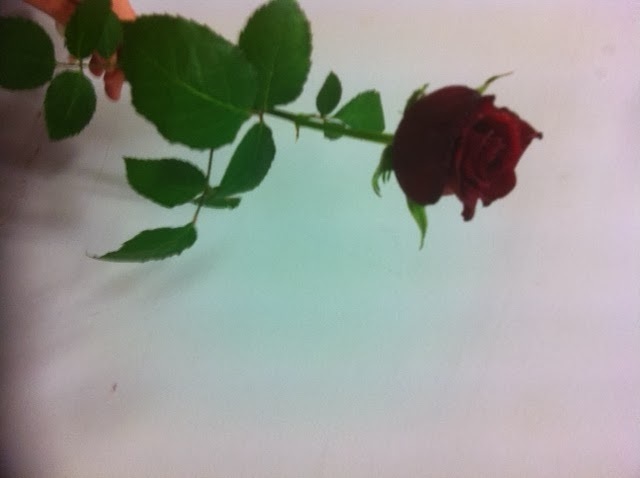 The centre is stuck to the flower with a little water. I also painted the daisies with pearl glaze, which really doesn't seem to have made much difference. I tried to make the daisies dry with curved petals by drying them in a patty cake pan, but only three dried sufficiently to be curved, and they tended to stick to the patty cake pan, despite the pan being dusted liberally with cornflour. Sweetopia has a great tutorial on how to make these daisies here. I think they are really pretty. Who wouldn't love a bouquet of edible daisies for their birthday? They say the simple things in life are often the best, and so it was with this week's Wednesday Donna Hay recipe. Margaret chose butter and parmesan linguine from p148 of Modern Classics I. This dish comprises linguine coated with a butter and parmesan sauce, seasoned with salt and pepper. I used cheddar instead of parmesan, as that is what I had. It was simple but delicious - perfect for dinner on the run. 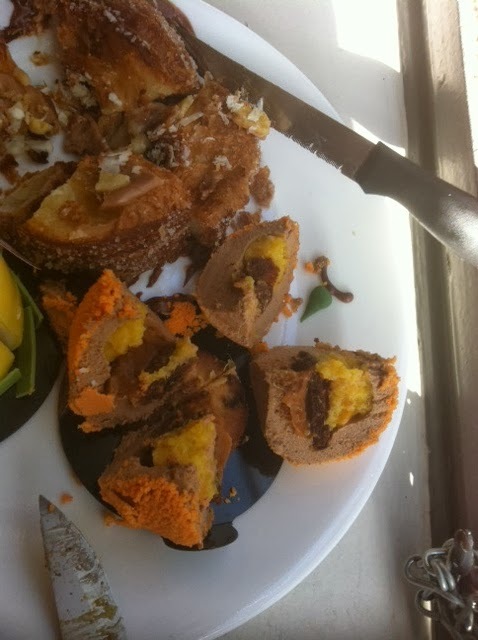 To see what Margaret, Chaya and Sarah thought of this dish, visit their websites. 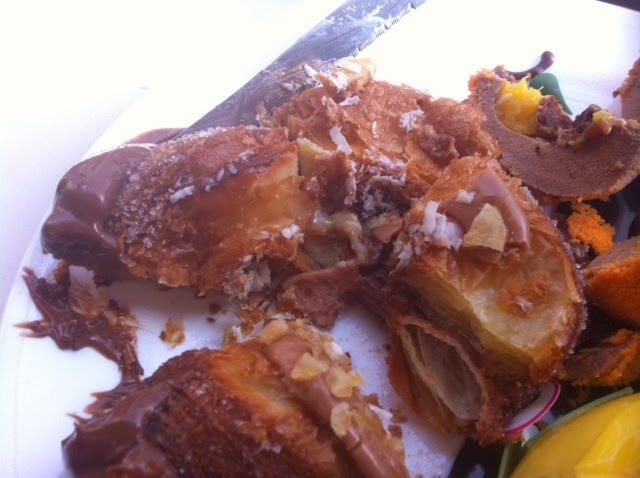 Last weekend, Tim humoured my request to do lunch at LuxBite in South Yarra. For Australian Master Chef fans, this cafe is the home of the lolly bag cake. LuxBite hadn't really registered with me until one of my Pilates classmates kept saying how great the desserts looked (although as it transpired, she had never been there!). 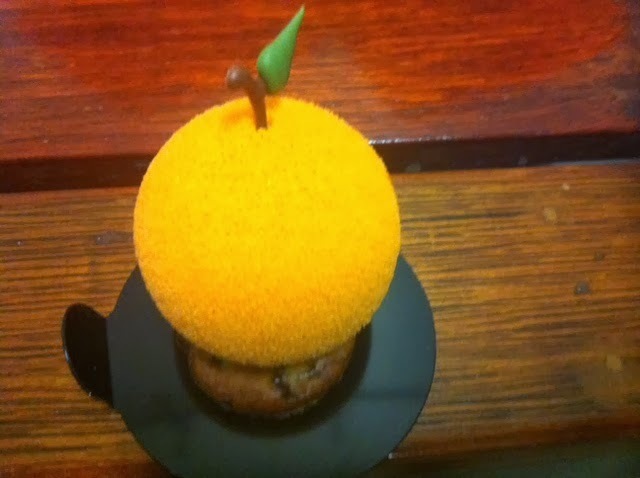 Not one to shy away from a great dessert, I put a visit to LuxBite firmly on the agenda. LuxBite is a relatively tiny cafe near the Punt Road end of Toorak Road. When we attended on a Sunday lunchtime, there was thankfully heaps of room for us at the large communal marble table in the centre of the cafe. The beef was very tender and melted in the mouth, and I love a fried egg. The only thing that would have made this better for me would have been a wee bit of chilli in the sauce, but otherwise, I enjoyed this dish. He enjoyed this dish also, and it certainly looks scrummy. We washed these down with coffees, which were quite good. the famous lolly bag cake ($7.50)! 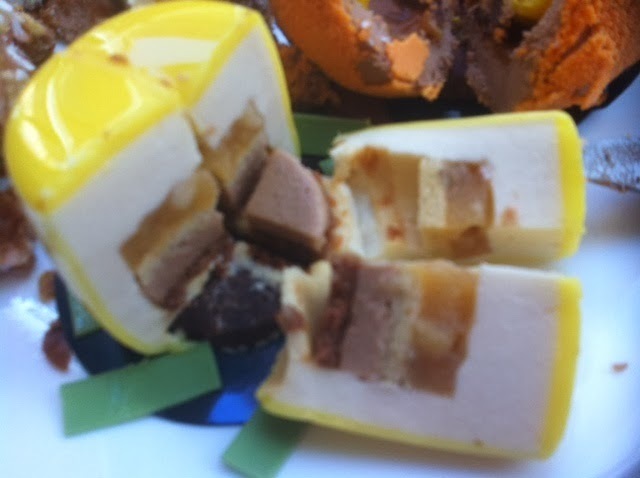 I didn't see this on Master Chef, but a sign in the glass dessert case tells you about it, and I have seen it on various Aussie blogs. Some have even been brave enough to make it. The lolly bag cake is inspired by trips to the corner shop by Aussie children, evoking a warm and fuzzy nostalgic feeling. For the uninitiated, in Australia, sweets or candy are known as lollies. The lolly bag cake comprises seven layers: banana lolly joconde, freckles crunch, mandarin jaffa ganache, musk mallow, another layer of banana lolly joconde, spearmint leaf buttercream and a Redskins glaze (yeah, the lolly is actually called a Redskin - please don't hate). 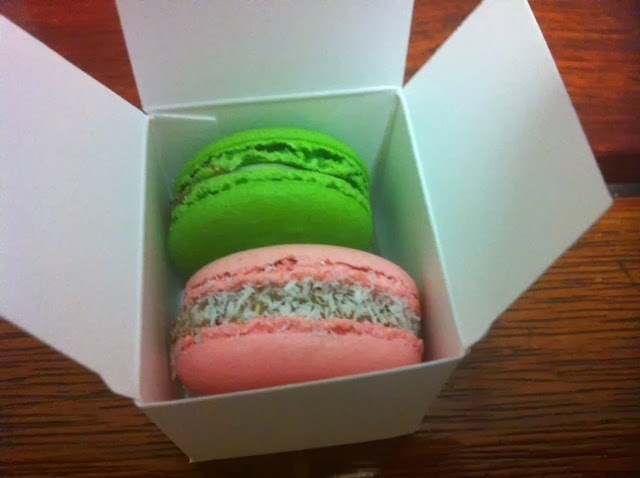 It was not as toothachingly sweet as it sounds, but was undoubtedly on the sweeter side. I liked it, but I didn't love it. The freckle crunch and the spearmint buttercream were my favourite elements. I would definitely go to LuxBite again. I have my eyes on trying a few more of their terrific looking desserts. Tahini is an ingredient that until fairly recently, I had never used. This made it rather mysterious and elusive. However, on the recommendation of my naturopath, I have recently been using it to flavour Greek yoghurt, which is rather nice. This batter is definitely not pouring consistency - you press it into the pan. I used dessicated coconut, white plain flour and less dates to match what I had on hand. It didn't seem to have a negative effect on the end product - it really was just like a peanut butter square. I liked this recipe and I would definitely make it again. 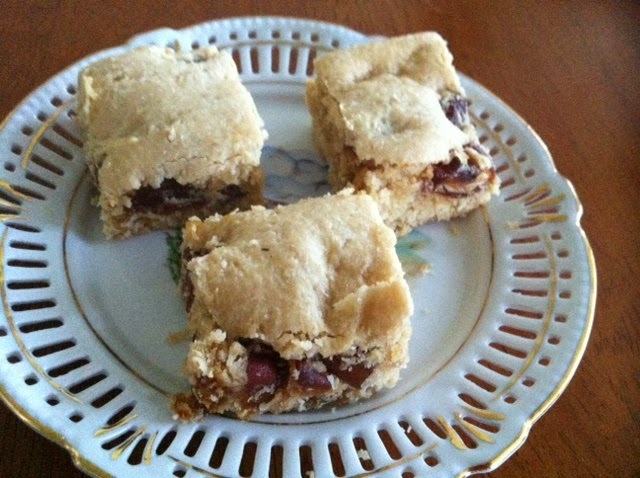 It is also super easy and quick to make, which is perfect if you are baking mid-week. Ah, pears and chocolate - they go together like a wink and a smile. In a fit of optimism, I had bought a number of William pears from the greengrocers, with full intentions of eating them for lunch, as snacks etc. Unfortunately, these were good intentions that did not materialise, and I had 3 sad browning pears in the fridge at the end of the week. I had wanted to make a dark chocolate and pear cake to use them up, but couldn't find quite what I wanted. However, I did spy a recipe for a bittersweet chocolate and pear cake on the Smitten Kitchen website from Al Di La, which is apparently a famous Italian eatery in Brooklyn, NY (but alas unheard of by me). 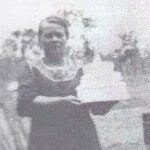 I had a sense of deja vu about this cake the morning after I made it, and sure enough, I had made it back in 2009. It's funny how different it looks this time - both cakes made by me using the same recipe with rather different results. I think this one would be even better with a small splash of booze on the pears - pear brandy perhaps? Go ahead and make it - I know you want to. Happy Friday everyone! Wishing you a lovely weekend full of all that is good. Friday brings us to our weekly rendezvous with Dorie, and this week, we have a dessert - definitely a great way to finish the week. This dessert is butter and rum crepes, served with a honey, orange and lemon butter sauce. I had never made crepes before although I had often meant to. Just by chance, I had bought a small frypan at Christmas time, primarily for omelettes, but it worked a treat with these crepes as well. I had meant to have these crepes for breakfast, but then started making them and read that the batter had to sit for at least 2 hours. No way! So I made the batter anyway, and had them for dessert instead. I made a half recipe - 5 crepes is plenty for one person. The first one wasn't the greatest, and the next one was a little browner than the rest while I was getting the hang of when to flip the crepes, but they all tasted good. I found using a small flat plastic spatula was easier for flipping the crepes than the offset spatula that Dorie suggested - I am clearly way more un-co than Dorie. While I did make the sauce and served it with the first batch of crepes, all that butter gave me the willies, especially when it had been in the fridge overnight and a thick buttery layer settled on the top of the sauce. Accordingly, for batch two, I ditched the sauce and ate the remaining crepes with vanilla icecream and berries. And the verdict? These crepes were delicious, however you served them. I would use the base crepe recipe again, forget the sauce, and have them with all kinds of fillings. They are not overly sweet crepes, so you could replace the sugar with a little salt and fill them with savoury fillings as well, I think. To see what my fellow Doristas thought of these crepes, visit the LYL section of the FFwD website. I am a self-confessed caramel addict. Caramel Koalas, Caramello Chocolate, Curley Wurleys, jersey caramels, Snickers Bars, toffees and the like make me swoon. In keeping with my love of caramel, I was stoked to find Nestle now makes caramel flavoured choc bits for baking (if you don't eat them out of the bag first). Because I like to be different, I didn't just want to make caramel choc chip cookies, so I hunted around for an alternative recipe using caramel bits. I was handsomely rewarded when I found this recipe for caramel sticky date muffins. Seriously, what's not to like? Moreishly sweet dates, caramel bits and a lovely caramel flavour. These went pretty fast at work, so I think I'm not the only one who liked these. 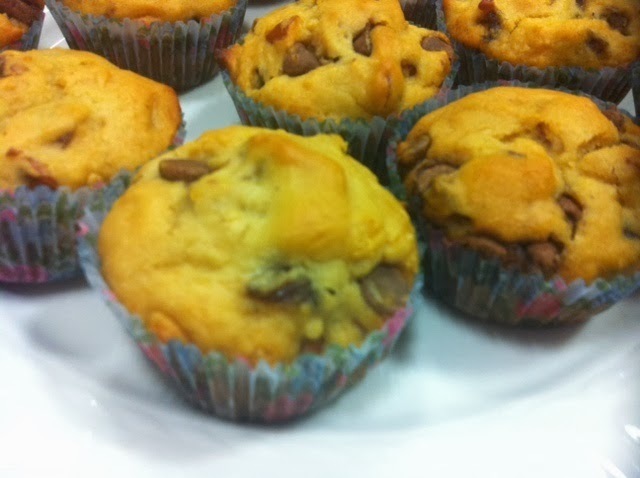 If you are looking for a lunchbox treat that is just a little different, these muffins could be for you. It's officially hump day - hope everyone has been having a good week. Being Wednesday, it is Wednesday with Donna Hay time at my place, and this week, it's my pick of chilli chicken wraps from p142 of Off the Shelf. 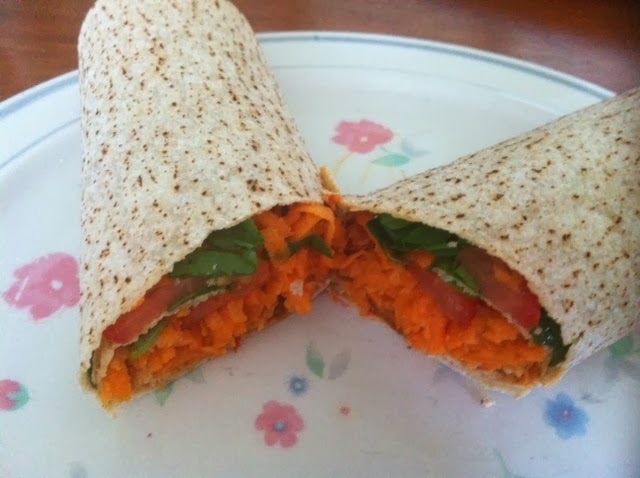 This one is exactly what it says on the tin - cooked shredded chicken is heated briefly with chilli paste, then placed in a wrap (flatbread) with grated carrot and salad of your choice. I used tomato and baby spinach. I enjoyed these wraps - the chilli chicken is what lifts it from drab to fab, and I enjoyed the chilli flavour. I'd definitely make this one again. 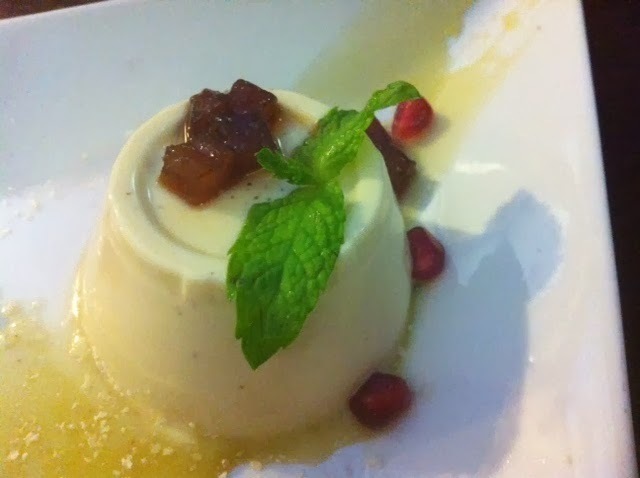 To see what my fellow Donna Hay devotees, Margaret, Chaya and Sarah, thought of this dish, visit their websites. And of course, you can join us at any time - just contact any one of us. 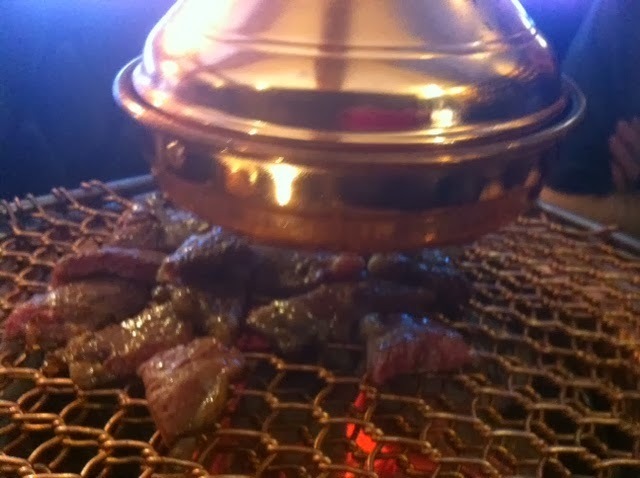 For Valentines Day, Tim and I went to Guhng (meaning "The Palace"), a Korean barbecue restaurant in McKillop Street, Melbourne. 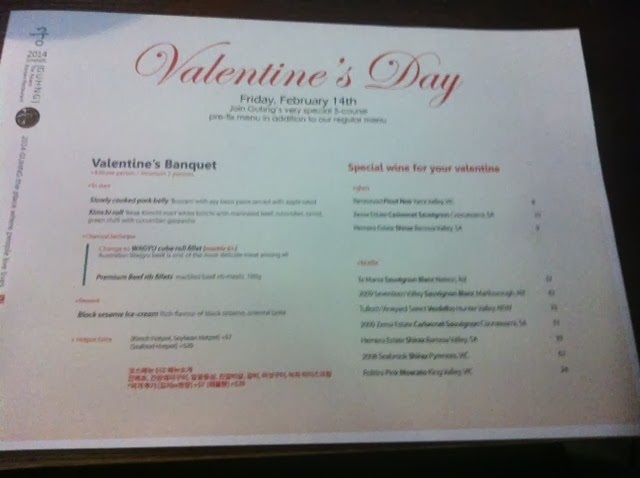 We have been there a couple of times before, but the menu has changed since then, and on this occasion, they also had a special 3-course Valentines Day menu for $39 a head. We naturally went with the special menu. The kimchi roll was very refreshing, but my favourite was the slow-cooked pork belly with soy bean paste and apple salad, which had a melt-in-the-mouth, caramelised flavour. 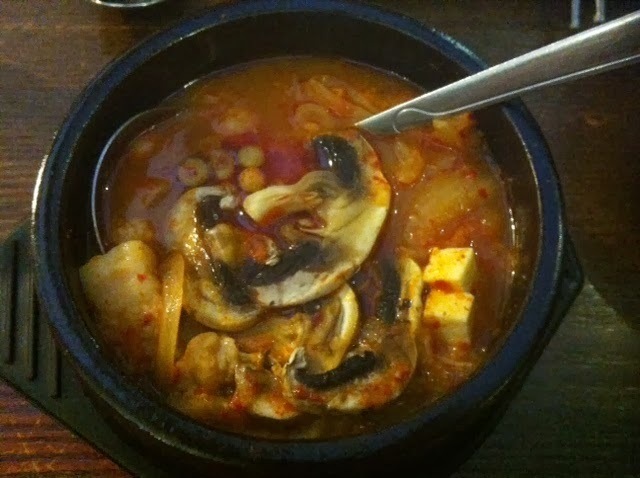 You should definitely try this spicy soup, which is one of the highlights of the menu for me, with its subtle heat and vegetable packed goodness. Our second meat was the premium beef rib fillet, cooked in an identical fashion. 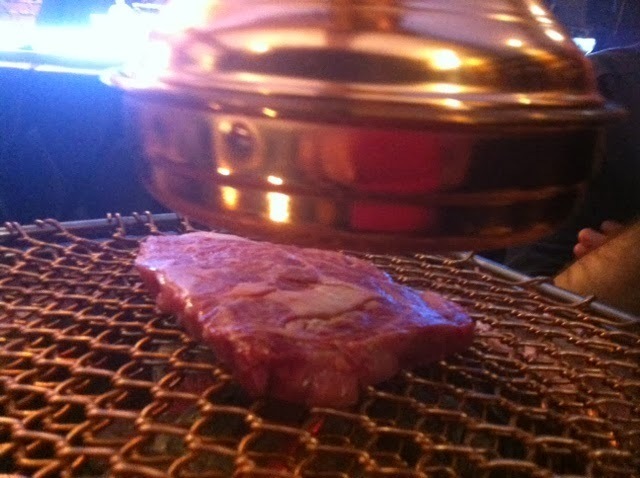 My favourite was the Wagyu, which is very soft and tender and just melts in the mouth. 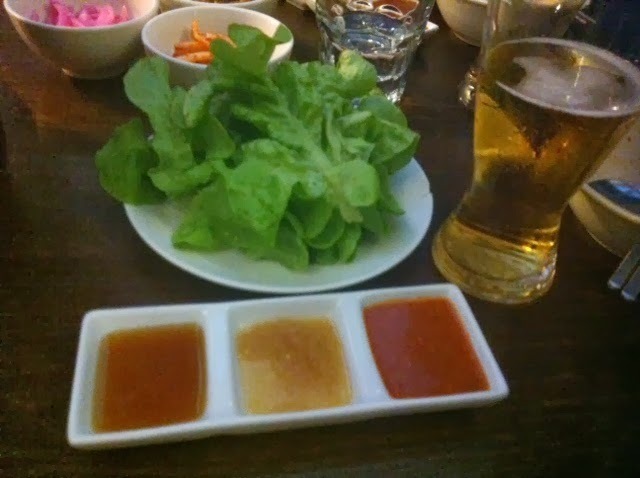 The idea is to put the meat, lettuce and condiments in your serving bowl, and I assume that you could wrap the meat and condiments in lettuce to convey them to your mouth - we just opted for picking everything up with chopsticks. I was worried that the licorice would be overpowering, but it was quite subtle - after the first couple of mouthfuls I didn't really notice it. 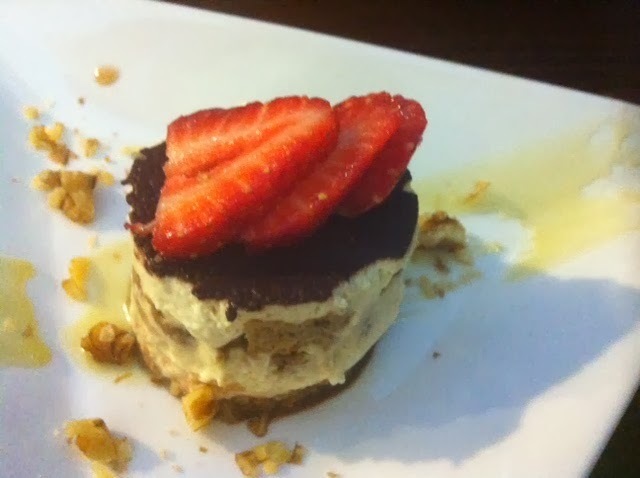 The stem ginger on top really made this dessert. Unfortunately I managed to snap the head off on the way home, but I enjoyed it while it lasted. 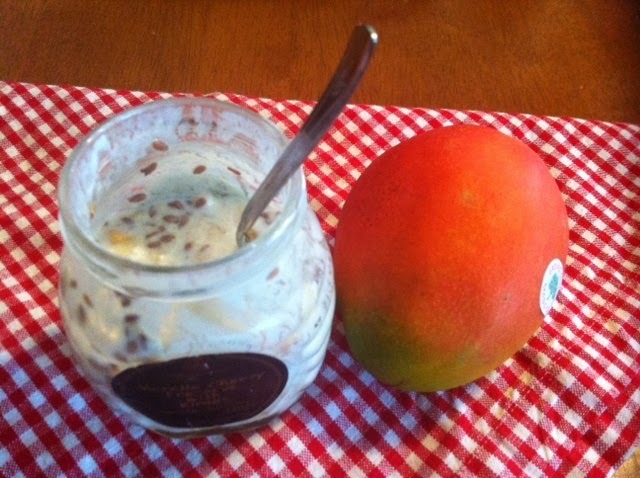 For brekky over the past week, I have been enjoying an amazing Mango Breakfast Pudding. 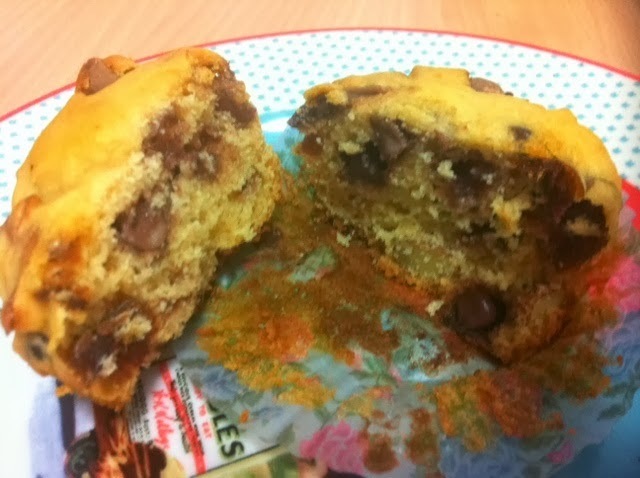 My Mum received the recipe by email from a work colleague, and sent it on to me. I do not know the original source of the recipe. Luckily, I had all of the ingredients, and was able to try it straight away. 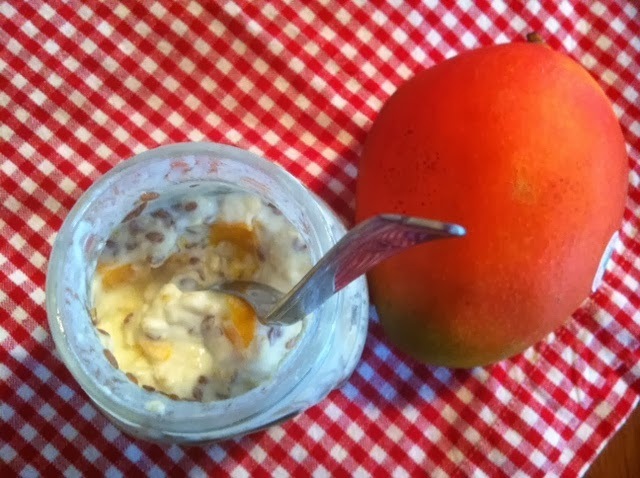 This pudding contains rolled oats, Greek yoghurt, skim milk, flax seeds (the recipe actually calls for chia seeds but I don't have any), honey and cubed mango. You mix it all up, and it thickens and sets up in the fridge overnight. The next day, you have a lovely breakfast pudding that is nutritious (I think!). In a half pint jar or container, add oats, milk, yogurt, chia seeds, almond extract and honey. Put the lid on the jar and shake until well combined. Add the mangoes and stir with a fork until mixed throughout. Put the lid back on the jar and refrigerate overnight or up to 2 days. Eat chilled. Happy Valentines Day! I hope you are spending it with the ones you love. I realise that not everyone celebrates or approves of Valentines Day, but I have always liked it, even as a mere bystander (which I have been mostly). A day to celebrate love is a wonderful idea to me. To celebrate this year, I have once again amalgamated the Valentine theme with my fascination for owls, and made Owl Cupcakes with a Valentine twist. Again turning to Google, I found these cupcakes, which are a twist on these ones that have been made dozens of times by various bloggers. I put my own spin on them by giving the owls heart-shaped pupils made out of strawberry sour straps. The eyes and ears are, of course, Oreos. To separate the Oreos, I used the tip to twist them apart, and smoothed over the icing following separation. It was a bit of a nightmare cutting the Oreos in half for the ears, and in the end, I had just enough and no more. The beaks are raspberry flavoured M&Ms, which are new to me and so delicious that quite a few went to the chef. For the base cupcakes, I used the white chocolate mud cupcake recipe from the Australian Womens Weekly Cupcake book, which is online here, and coloured light pink. The frosting is the Primrose Bakery Vanilla Buttercream, dyed pink. 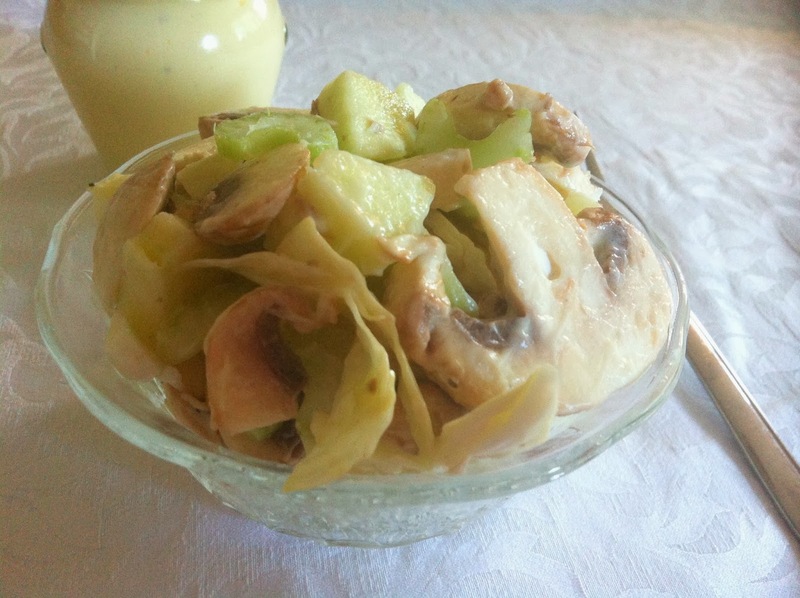 This week's French Fridays with Dorie recipe is a study in monochrome - Helene's All-White Salad. Not being huge on salad, I was not sure how I'd like this, and I especially wasn't sure about the dressing, a yoghurt vinaigrette which is mayo-like in consistency. Be warned that this recipe makes an enormous amount of salad - I made the mistake of making a whole quantity and being stuck with this salad for days. In the end, I stir-fried the leftovers just to break the monotony. I was happy with how the dressing came together - I have never made mayonnaise, but read enough food sites to know that it can all go dreadfully wrong with the oil splitting from the fat. However, got lucky this time, and it worked a treat, resulting in a creamy, thick mayo-like dressing. That said, this was quite a meaty, yummy salad. 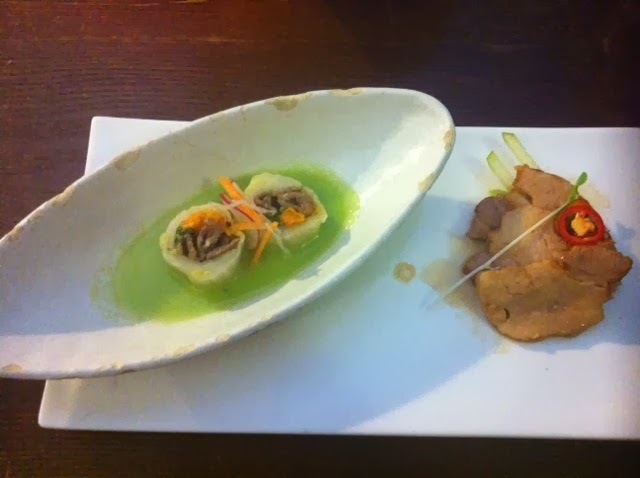 The mushrooms and the apple were the highlights for me. I ate this salad the first time round by itself because I was to full from the rest of the day to eat anything else, and enjoyed it. I then ate it as a side a few times with work lunches, before finally giving up on it and stir-frying it. 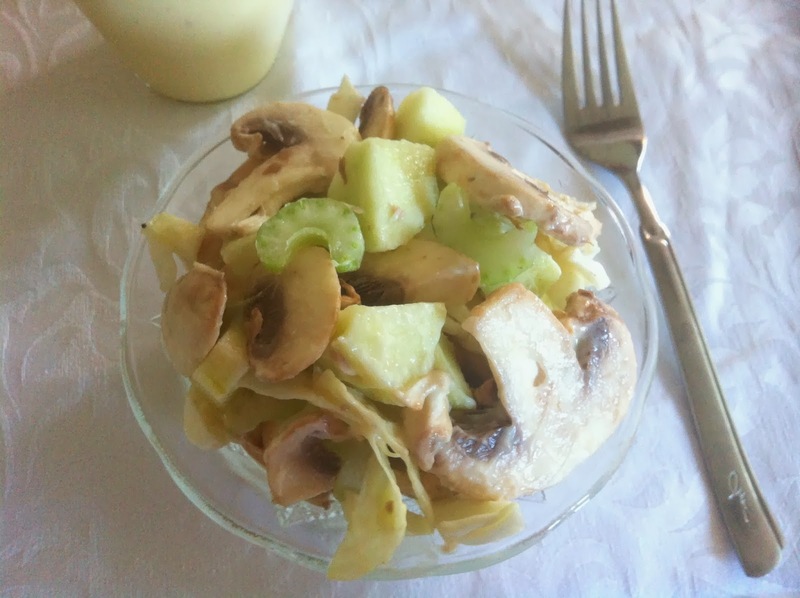 To see what the other Doristas thought of this "white" salad, visit the LYL section of the website. My former Pilates instructor, Emilia, is back intermittently from maternity leave. 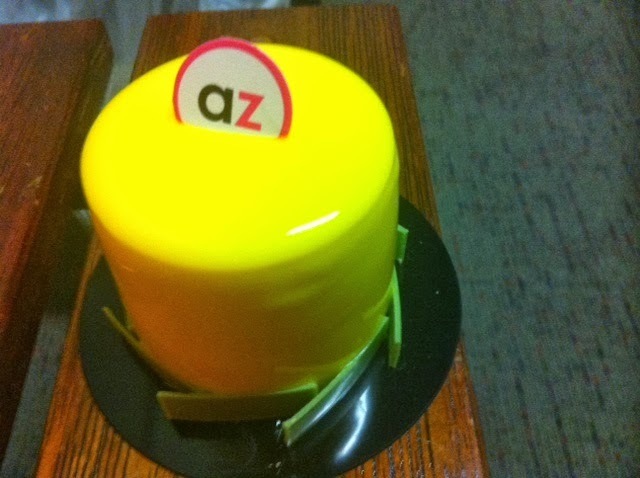 Being a genius, she suggested that we have a Zumbo cake party at one of our classes with treats from the newish Adriano Zumbo store in South Yarra. 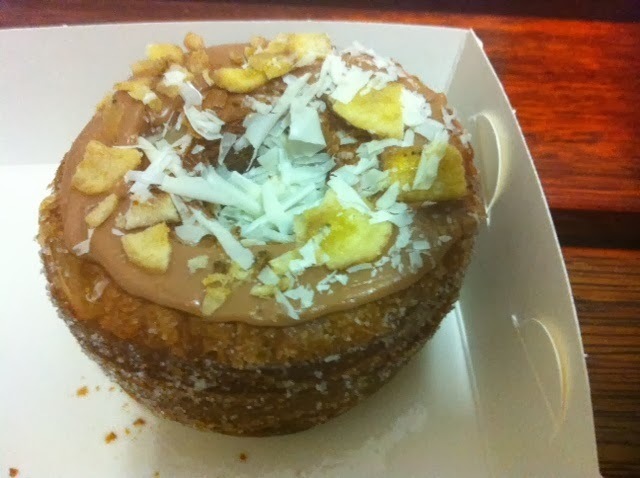 I decided to seize the day on Monday, and even though Emilia was not in, I went for a Zumbo splurge for our Pilates class, and asked Loz, our instructor, to save a couple of pieces for Emilia. The clove layer had a real kick in the tail and takes over from the initial orange hit. I thought that there was pop rocks in there because of the distinct crunch - perhaps it was the sunflower seeds. It was actually tastier than I thought it would be - not at all greasy and heavy. They look so good, I can't wait to try them. 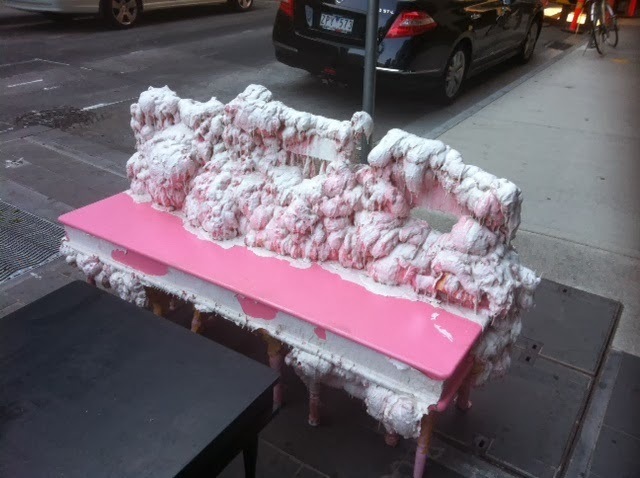 There is nowhere to sit in the store, which is just a narrow hole in the wall; however, outside, there are two marshmallow goo chairs around a table on which to enjoy your treat, if you so desire. The marshmallow stuff is rubbery in consistency - I had to know. 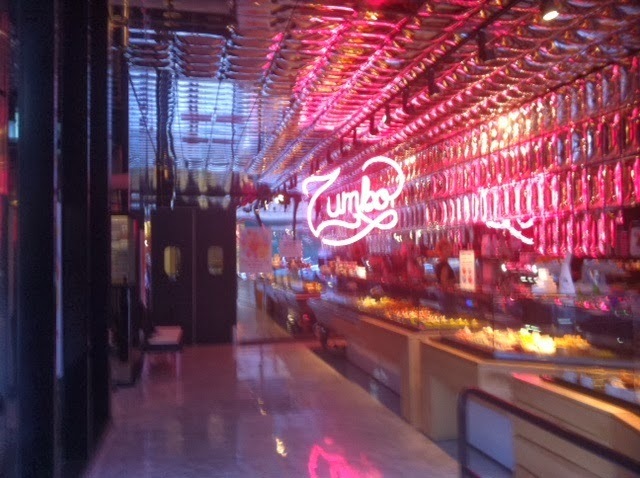 My trip to Zumbo was a romp through fairyland, as it always is, and it was fun to share the treats with my Pilates class.